It has become common knowledge in Washington that, if you want to bury bad news, the best time to do so is on a Friday afternoon, or over a holiday weekend. So it is especially telling that, when it came time to strike at one of the most effective agencies in the federal government, the Trump Administration chose a two-for and announced its plans for the Consumer Financial Protection Bureau on Friday evening over Thanksgiving weekend. 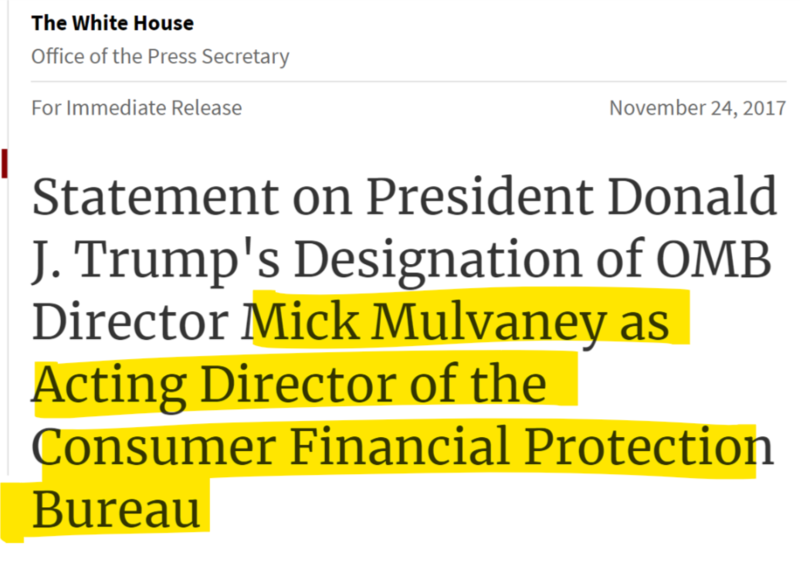 While most of the country was (the White House hoped) distracted by black Friday sales and family gatherings, President Trump announced he had installed Mick Mulvaney – who once referred to the CFPB as a “sad sick joke” – as acting director of the agency. The move is just the latest in a long line of Presidential appointments designed to dismantle government agencies from the inside by placing their fiercest critics in charge of their work. But Trump’s move at the CFPB is probably illegal, politically risky, and could backfire in a big way. While public trust and confidence in the federal government is sagging, to say the least, the CFPB has managed a nearly impossible feat: Both Republican and Democratic voters agree, overwhelmingly, that the agency has an important job and has done it well. That bipartisan support is likely due to the unique independence the agency enjoys, which was a key part of its original plan. By ensuring the Director would not be beholden to the President, Congress also ensured it would be free to take on big banks, payday lenders and Wall Street’s bad actors without fear of political repercussion or retaliation. It allowed former Director Rich Cordray to go after Wells Fargo – to use just one example – even while the bank filled the campaign coffers of candidates from both political parties. The result has paid very real dividends for consumers. Since its founding, the CFPB has returned $12 billion to consumers cheated, defrauded and wronged by the financial services industry. It’s a narrative that should play bigly with the President’s campaign promises to look out for the little guy. But the President, instead, has put politics – and Wall Street – ahead of the voters who put him in the White House. In selecting Mulvaney, who will also retain his position as director of the Office of Management and Budget, Trump has installed his own direct report at the agency, wiping away any sense of independence the CFPB once had. This is flatly contrary to the provisions in Dodd-Frank, the statute that created the CFPB, that require that the head of the Bureau be completely independent (like the Chair of the Fed). But with a political appointee whose main job (at OMB) is controlled by the President, rather than having the freedom to go after corporations based on what they’ve done wrong, Mulvaney will now undoubtedly have to seek the President’s blessing to do so. And anyone who doubts where Trump’s allegiance is needs only to look at the long line of Wall Street bankers who now hold top positions in his Administration. That, in turn, leaves little doubt as to why Trump has chosen to appoint – at least for now – an “acting” head of the agency. By doing so, the White House hopes to avoid a Senate confirmation hearing that would almost certainly come with withering questions about the Administration’s assault on an agency that has become increasingly popular among its own voters. But voters deserve those answers, and the White House should not be allowed to use political loopholes as part of its strategy to deliver a death knell to the agency. In fact, Mulvaney’s appointment is, itself, of questionable legitimacy. Cordray’s Deputy Director at the agency, Leandra English, has filed suit to stop the OMB head from taking over, citing language in the law creating the agency that makes clear the President cannot avoid Senate confirmation of a new Director, and that the Deputy Director (in this case, English) should serve as the agency’s head until the Senate approves a White House nominee. It may be an uphill struggle, but we strongly urge Senators to insist that the Administration begin to respect the idea that the agency serve as an independent watchdog. If the White House ignores this principle, at least if there are public hearings, those will give the consumers the agency is charged with protecting the option of weighing in with their elected representatives. Sadly, the President seems intent, instead, on making sure the wolf is put in charge of the hen house, with the apparent goal of making the CFPB the latest casualty in the White House’s war on competence. And while defeating any eventual permanent nominee for the agency may be its own uphill battle, every consumer who feels like Wells Fargo already has enough friends in high places should get ready to fight like hell to protect the last friend the little guys have left in official Washington.